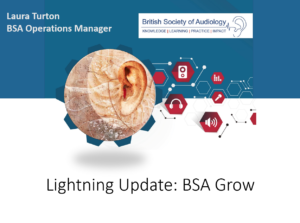 BSA Grow, is a members online learning community from the BSA. The BSA wants to promote excellence in hearing and balance through the best use of evidence based practice. Grow is one way in which we hope to fulfil our vision. After listening to members we have created a flexible and cost effective way for you to stay up to date with the evidence and undertake your CPD. Log on at times that suit you, minimising the impact on when you take time out to learn. Many of the resources are free to members, with some modules having small fees attached to make learning accessible to all. ​In addition to webinars and learning modules there are also forums for you to take part in debates and network with each other. If you need any support as you start to use BSA Grow please read the FAQs below or contact the helpdesk for this platform on support@iCohere.com who are based on the East Coast of America (so normally pick up emails from 12pm UK time onwards.) They will be able to support any issues you have when connecting to BSA Grow. In 2017 the BSA launched a new membership benefit through BSA Grow, have you logged on as a member and viewed any of the resources? Here’s some of the highlights of 2017. 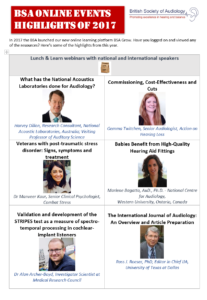 Do you want to read the full abstracts and bios of the Lunch and Learn speakers?